I love grilling outside with Jeff in the summer. Smelling aromas from the food on the table and grill before tasting it, feeling condensation on a cold beer bottle against my warm hands as well as the latticed pattern of the wrought-iron table underneath it, and hearing the sound of my husband’s voice are all part of the wonderful sensory experience of it. When we lived in Boston, that opportunity lasted only a few months out of the year. I loved carrying trays outside with whatever we were grilling, and sitting down together at our outside patio table. Cars would pass by, and we’d occasionally wave at them while sipping beers and talking about our day. Our indoor-only cat, Nimrod, would pop up at the window near where we were eating, and meow loudly behind the window screen, confused as to why she wasn’t invited to this particular table. Now that we are in Redondo Beach, grilling outside is something we can do throughout the year, in our little patio space. Nimrod still has found a nearby window screen to press herself up against while we eat, meowing incessantly while Jeff monitors and flips whatever he’s put on the grill. Grilling for us usually involves fried okra on the table. My protein of choice is sambal seitan skewers, and cold beer or wine is always on the table. It wasn’t until I made a batch of these sambal and sesame dressed green beans that we’ve decided that these should be included on the table as much as possible. When sesame and sambal collide, it releases an amazing aroma that’s both deep and vibrant, rich and bright. Dragging these soft and crispy grilled beans through this dressing makes me intensely happy during the evenings we share while eating, laughing and relaxing outside. 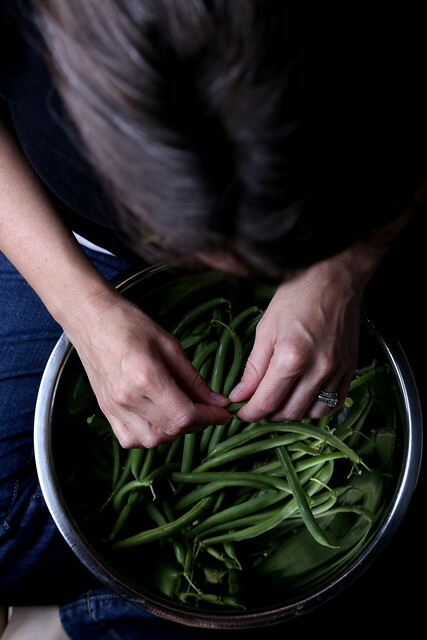 Snap the ends off the green beans and discard or use for making vegetable stock later. Rinse and pat dry. Place the beans into a large prep bowl. Whisk together the sesame and soy sauce, then drizzle over the beans. Toss to coat. Place the beans onto a grilling tray in a single layer. Grill on high for 8-10 minutes, turning once. Throw the grilled green beans back into the prep bowl and toss again with the leftover sesame oil mixture in the bottom. Drizzle with sambal and toss again, then sprinkle with sesame seeds and red onion. Serve warm or at room temperature. Thanks for this recipe, it looks divine. I can't wait to try it. IIona, I'm so happy you made this and liked it, thanks for your kind feedback!